Here's some new work by the graffiti artist Hozoi. 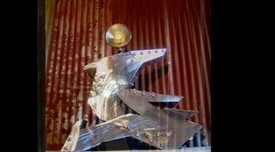 Metal graffiti sculpture! Hozoï has just finished his graffiti world tour: the "Hozoi two-wheel Trip". Amazing walls and motorcycles from all around the world. The graffiti artist Hozoï is back from Malaisia and Indonesia. Pictures and video of his famous sharp letters on asian walls.